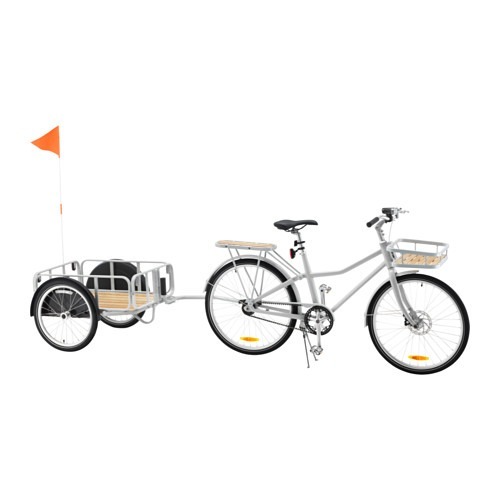 Starting in February 2017, you’ll be able to pick up IKEA’s new Sladda bike in stores across the US. Or, if you just can’t wait, you can order it now on IKEA’s US website, starting at $399. I know a lot of folks are already complaining that it won’t be a “real” bike. Seriously, with a 10 year warranty on the belt drive, with disc brake and a rear coaster brake? With a $25 Front Rack, a $129 Trailer, and a $30 Bike Bag (that converts to a backpack)? This was designed with a carry handle on the frame and appears to include lights and a bell. A BELL! Standard. I think I have just found my new commuter bike.